We leave tomorrow morning for a Hawaiian getaway, and I’ve been busily working on a few sewing projects. I had lofty goals when I started just a week ago, but I slowly came back to reality as each day nudged me closer to our departure. The photo above shows my handiwork … albeit not yet ironed. The brown shirt is the one I wished to replicate. Using Kwik Sew men’s pattern 3422, I came very close in my knock-off taupe shirt. 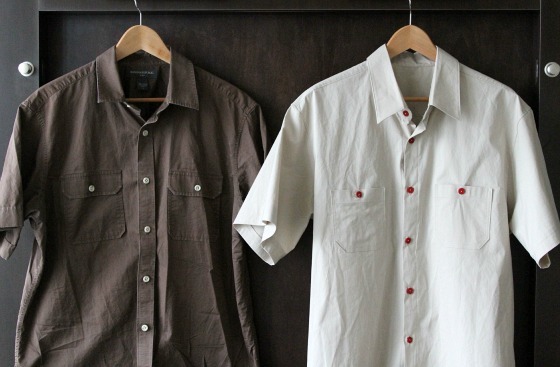 I love a short sleeve button-down – it’s really my summer must-have. My favorite shirt is one that I purchased from Banana Republic years ago, and it’s getting close to retirement. Instead of buying another one for a hefty amount, I decided to put my sewing skills to work! I shopped for a similar fabric and was surprised to find the exact same material, 98% cotton / 2% spandex. The spandex doesn’t make it stretchy, but it gives the fabric a rugged firmness that I like. Fortunately, the fabric was on clearance for a mere $2.99 per meter! (so, only $7.50 of fabric) I also bought fabric in another color to make Joe a shirt at the same time (slate blue with dark blue buttons). Added more reinforcement topstitching around yoke, sides, etc. In a future version, I will adjust the shape of the collar as this one errs on the 1970s side. I would only need to adjust the point to make it less sever and a bit more stubby. 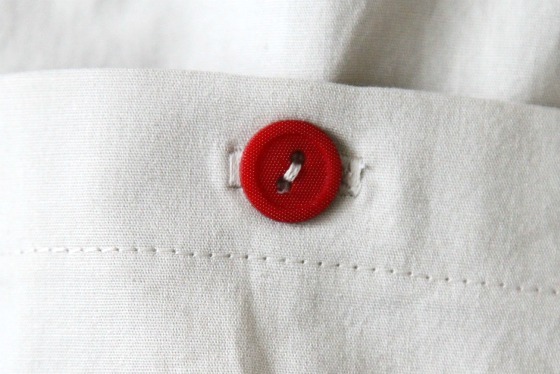 I decided to make the buttons ‘pop’ by using red ($5 in buttons). The buttons are quite cool, a matte finish with a slight texture. After I finished these two shirts, I started making t-shirts. A whole new saga that I’ll save for a post-vacation post! Very nice…your tailoring talents are emerging. Did you know Tim Conway loved to sew, and sewed many outfits for his children and wife, and often his own costumes when he was on the Carol Burnett programme? I appear to have run into a similar problem with a Banana Republic short-sleeved shirt. I haven’t sewn in years and BR seems to have retired the style and colour I used to buy. Where did you find the fabric?